How To Tell What Key You Are In When You Have Flats (b) In The Key Signature! If you're going to be able to know what chord progressions are likely in each key, you obviously need to know how to find the key of a song quickly -- correct? Did you know that the flats in any key signature always occur in the same order? Once you know that order, you will never again wonder, "Which notes are flat in this song?" 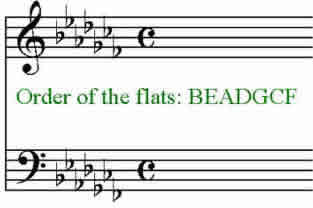 Notice that the first four flats spell the word "BEAD." You can remember the last 3 flats by making up some silly saying such as "Go Catch Fish" or any similar phrase that grabs your fancy. So if there is one flat in the key signature, what is it? If there are two flats in the key signature, they are what? Sure. Bb Eb Ab Db and Gb . You got it. That's all there is to it. To find what key you're in, just take the next to the last flat and that IS the key. For example, if you have 4 flats, they would be Bb Eb Ab Db. The next to the last flat is A, so you're in the key of Ab. If you have 2 flats, they are Bb and Eb, so the next to the last flat is Bb-- therefore the key is Bb. If you have 3 flats, they are Bb, Eb and Ab. Since Eb is the second to the last flat, the key is Eb. If there is only 1 flat in the key signature, it would of course be Bb, and you'll just have to memorize that it is the key of F. And you no doubt already know that if you have no flats or sharps in the key signature, you are in the key of C major (or A minor -- but we'll take that option up later). Get this down cold -- so you immediately know what key you're in when you have flats in the key signature of a song. Why? Because once you know what key you are in, you also know which 3 chords are the most likely -- right? Next week we'll do the same thing with sharp keys, so you can know immediately what the key is and therefore what the 3 most likely chords are!